Ally Pally - part 2! Well, yeah, I was back at Ally Pally for the Knitting & Stitch show yesterday. One day just isn't enough! I'd volunteered for the lunchtime slot on the Relax and Knit stand, which meant I got to hang out with fellow knitters and members of UKHK. Here I met Anna again, and met Penny and Ann (pixeldiva) for the first time. I didn't really get the chance to teach anyone to knit, but did have a good fiddle with Sue's knitting frame - without instructions! I need to have a play on mine (I have got the full info) as some folk have told me there are a couple of ways of using it. Thanks to Yvonne for organising the stand - besides the fact that I enjoyed meeting new knitters, it'sa really worthwhile event, spreading the knitting skills. After the spending spree that was thursday, when I bought all the necessary ingredients for a myriad of xmas pressies, yesterday's purchases were going to be all for me! I also had a wander around the many exhibits with my camera, and have added a link to the shots in my 'galleries' section. I did go a tad over budget, and have owned up to Tom... yet one of the purchases I may re-sell as I'm not so sure it was a good idea. And so for the moment, I've not photographed it. Tom thinks I should keep it! 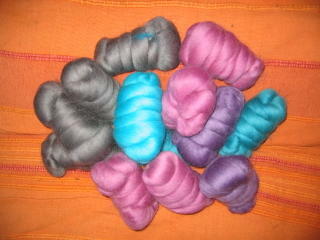 Lush, lush hand dyed wool from Silkwood yarns. Before you moan, it's v.dark purples and blues, ok? Not sure what to make with it yet - may knit it then felt it. The flash doesn't do these yarns justice. More joys from Handweavers - spools of rayon yarn for perhaps pom-poms, braiding or embroidery... beautiful greys, purple, pinks and heathers. The dip dyed yarn is the same colourway as one that I bought on thursday. Bundles of rovings from Handweavers - they like their '50p' sales! similar colours to the spools of rayon. This little lot will probably become beads or jewellery - got a great little booklet from the Piiku stall that reveals some fantastic secrets for making beads, bangles etc. And the non-yarny things... exhibition catalogue for the Quilts 2005 competition/show. Great photos and info on all the artists (found this after I'd taken all my photos!) The felting booklet from Piiku. Prudence Mapston's Freeform book - I met her briefly but didn't get a chance to chat, which was a shame. Mind, the sales assistant did get her to sign it for me! Have another freeform knitting/crochet book, but this one has better instructions. And a couple of pairs of beautiful hand made birch needles. The ones which caught my eye are the ones where the ends seem to have slipped down the needle - apparently they are 'swing' needles ( as apposed to staights, circs etc) - does that mean anything to anyone? Hopefully blogger will play fair and allow me to upload everything. Tom's doing some maintenance on my dreads, and I'm going to get on and finish the first of the xmas pressies. I may post photos of these in progress; it depends on who's watching! Newer:Boyfriends have their usesOlder:Knit that stitch, teacher!